"I feel incredibly proud to be part of the celebration of 25 years of Monday Night Raw, which is a show that my father created. When you think about the impact and the legacy that Monday Night Raw has had on the media, entertainment and sports worlds, it's significant. I'm just so incredibly proud to be there to celebrate this milestone." "Well as often happens at Monday Night Raw and at WWE television it's a lot of run-and-gun because it is live. What I mean by run-and-gun, it's a production term, where you have your crew basically they are on the fly, they are on the go, they are on the move. And we needed an extra, for Stone Cold to ask where The Undertaker was. "So really I just happened to be at the right place at the right time and I got thrown into that scene. 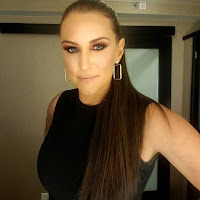 It wasn't a strategic decision for Stephanie McMahon, Vince's daughter, to make her debut on television. I was really just an extra in the moment. And it was incredible. I mean to be a part of the show, with Austin? That was certainly a memorable moment for me." "My most favorite moment is when I had the opportunity to announce the first ever women's Royal Rumble match. And I think one of the reasons why is because I had the chance to acknowledge the women in the ring, the women on Monday Night Raw, the women on SmackDown LIVE, the women on NXT and any woman to ever step foot inside a wrestling ring, regardless of what promotion they worked for, because they are all a part of this moment in time, they are all a part of making it happen. "The women in the ring didn't know what I was going to say. We were chastised by some fans because we broke character and I told the women earlier in the day - they knew I was coming out but they didn't know what I was going to say - I told them react naturally, don't feel like you have to be in character, it's okay for you to react however you want to react, to whatever I'm going to say. We all broke character that night."